I have three daughters and this is my second hope chest build. This one is for daughter #2. Design is a spin off of the NYWS blanket chest, which I re-sized and modified for raised panel construction and mitered corners. The finish consists of three coats of hand padded blond shellac and three coats of satin sheen rattle can lacquer. If anyone is interested, I blogged about the build here. 1. First time making raised panels. 2. First time using router bit set for rails and stiles. 3. First time doing long miter joints (connecting the stiles at the 4 corners with an invisible seem). 4. First time padding shellac. 5. First time spraying lacquer. As you can see, my customer is pretty happy with the project. Little does she know that she holds more than one key in her hand. 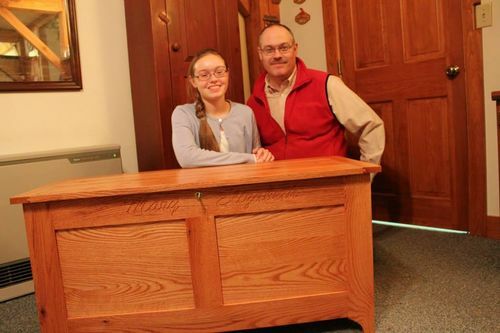 For comparison… here’s the first build for daughter #1, made of Red Oak harvested on our property. Very fine work on both the builds and raising three daughters! Congrats on succeeding on all those “firsts” on the build. Your client does look very pleased. I imagine Daughter No. 3 will start planning the design of her own chest now . . .
Nice job Matt. I guess that’s the best you can expect with scrap lumber. Really, it’s beautiful. Wow! This is a beautiful piece and you did a wonderful job on this chest. Beautiful work. That is really quite nice. Really turned out great Matt. This is definitely on my need to build list for my daughter….well done. Very nice work! I like both versions! Beautifully crafted and finished, Matt!